In a city of a thousand planets, surely there has to be something better to watch. I like Luc Besson. Problably more than I should, considering he’s kind of a creep. Luc Besson is the Woody Allen of France. I also really like weird French and Spanish sci-fi and fantasy. Those can also be kind of creepy by our American standards. For free entertainment, I managed to get myself on the list to get free movie screening passes. Recently, this has gotten me into a couple of super advance screenings of movies that aren’t due out for months and months. Contractually, I’m not allowed to say anything about the movies, but there wasn’t anything in the confidentiality agreement about talking about the screening process. So let’s cover those in the broadest terms. After the movies everyone in the audience gets questionnaires. And when I say everyone, I mean everyone. Every opinion is the same. My opinion doesn’t matter any more or less than the guy in the American flag shirt with the cut off sleeves…and yeah, that guy really exists. My opinion doesn’t matter any more or less than woman who kept misplacing her child because she was doing something else. My opinion also doesn’t matter any more or less than that child, who also gets a questionnaire! Technically, my opinion matters less than all the aforementioned people because I’m too old. 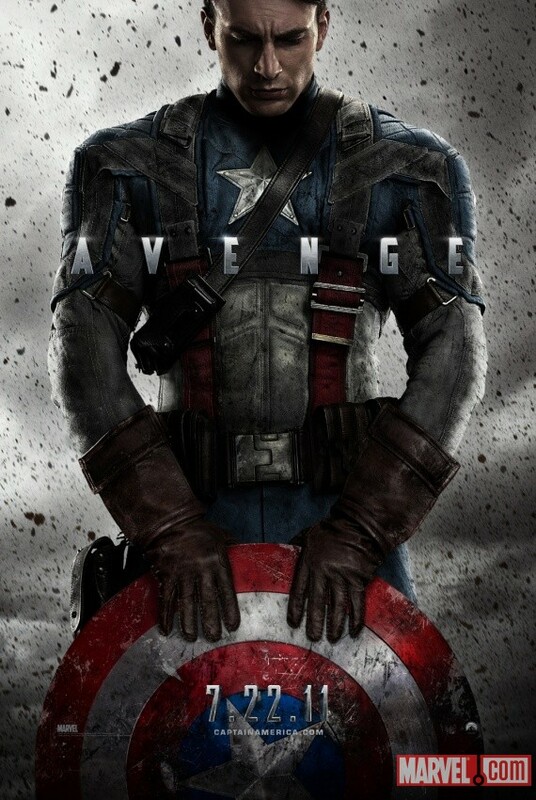 It’s no secret to anyone who knows me that I’m a Captain America nut. He’s been my favorite super hero since before I could read the comics I picked up every week from my Grandpa’s book store. Imagine my elation when I heard they were finally going to make a proper big budget movie starring my hero, directed geek demigod by Joss Whedon. Of course, big super hero summer movie means dedicated toy line. 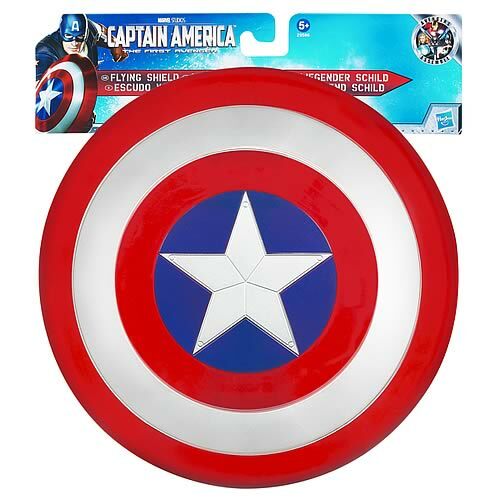 The Captain America toy line from Hasbro follows the model Hasbro set up when they made Iron Man 2 toys last year, two separate lines of 3-3/4” action figures, one based on the movie, and one based on the comic book version of Cap. The movie line has yet to hit stores, but last week the comic series started popping up on shelves at retailers everywhere. So far only the first four basic and three deluxe figures are out, along with a few vehicles and role play items. These figures are nice. Like the Hasbro Marvel Universe and Iron Man lines, they boast excellent articulation and beautiful likenesses of the characters. The toys combine collect-ability and playability very well, with multiple cool accessories. 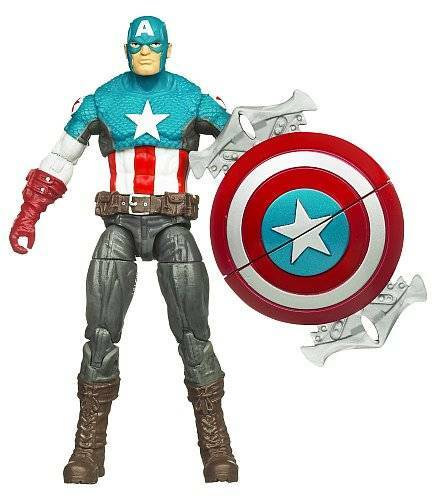 So far I have picked up the Winter Soldier and Battlefield Captain America figures, and am very please with both. 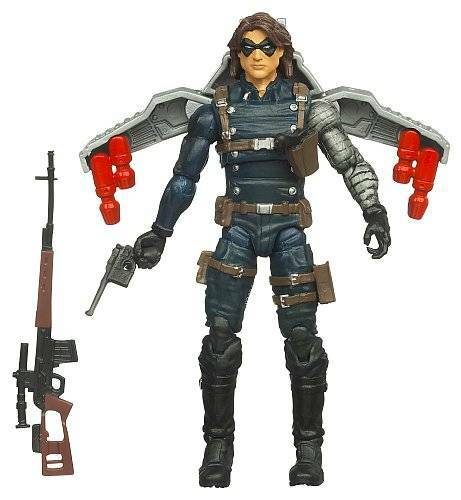 The Winter Soldier comes with three guns, and has holsters for both of his hand guns. He also comes with a winged rocket pack, adding a cool play option for kids. 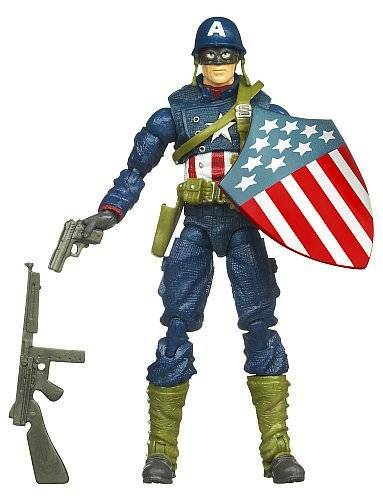 Battlefield Captain America comes with two guns, his old-style triangular shield, and a removable helmet. 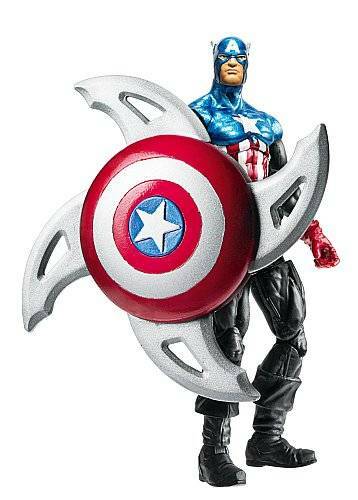 The shield can easily fit on his arm, or on his back for carrying. Both are lovely figures, with very nice sculpting and detail, making them very true to their comic book likenesses. Some of the other figures have gimmicky shields, which collectors and purists won’t be happy with, but add a playability factor for kids. The deluxe figures come with accessories for added play value, but aren’t patently goofy like so many other lines can be. 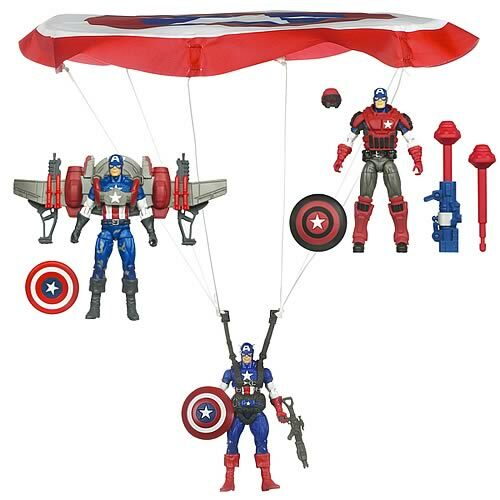 There is a Parachute Cap, one with a winged jet pack, and a Fortress Assault Cap. The Fortress Assault version is the goofy one of the bunch, with Cap in red armor and carrying a missile launcher. 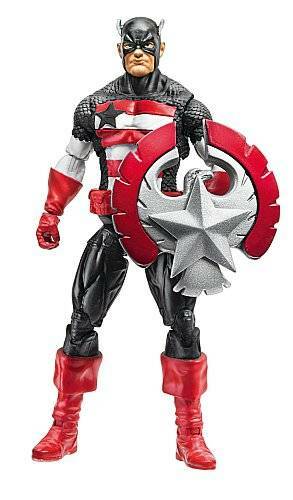 Future waves include characters that have been overlooked by Hasbro in the Marvel Universe collection, including Crossbones, U.S. Agent, the Red Skull and Hydra soldiers. One can only assume they were holding them back, knowing they would be making this line for the Captain America movie. A few minor complaints, though – the paint apps can be a bit spotty, so you need to look the figures over before buying to make sure you get a good one. Also, The gimmicky shields are a bit silly on some of the figures, I would prefer U.S. Agent and Heroic Age Cap with their standard shields to display in my collection. The role play items or kids are pretty cool, too. 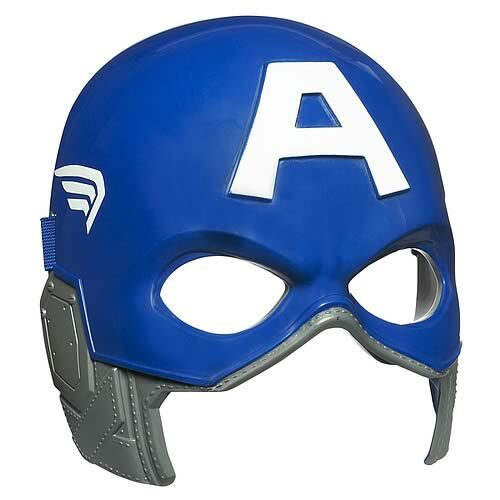 They include a shield that shoots little disks, a standard Frisbee-like shield, a mask, and a full costume. Overall, I love this toy line. Yes, it has its goofy kid stuff in it, but mostly it is very collector friendly. 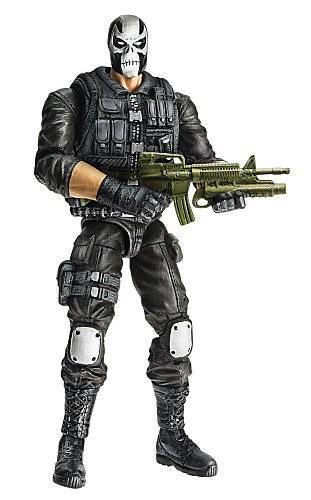 I will be buying many of the figures, and am especially looking forward to Crossbones, who I was never able to get the Marvel Legends version of. My kids will also probably talk me into picking up many of the role play items for them. This is definitely the best movie tie-in line this summer, easily besting the Thor and Green Lantern lines. Hopefully, the line sells well, and we will see more comic characters pop up, like Batroc the Leaper (I can dream, can’t I? ).